You're on vacation, don't settle for the same mundane breakfast: frozen food, deep fried, and served all you can eat. At Belgiis we serve breakfast in Wisconsin Dells a little different. Waffle Hander®? It's a gourmet waffle SANDWICH you eat with your hands. Waffle DOUGH is made fresh daily. 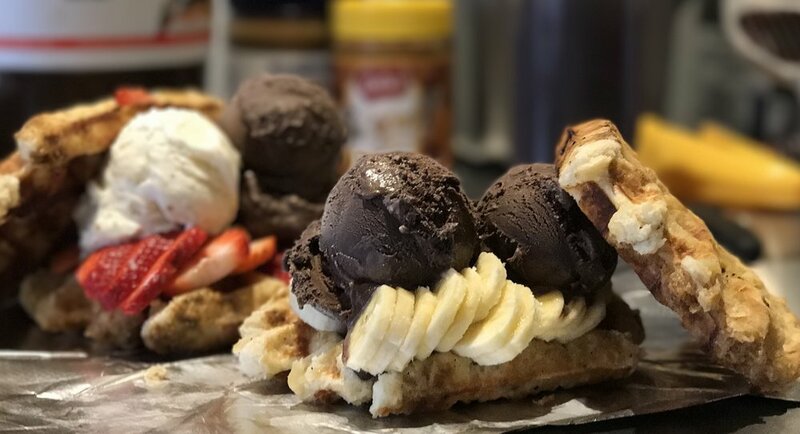 Each waffle crafted to order using premium ingredients: local Wisconsin cheese, dairy, meats, super premium ice cream, and whole fresh ingredients. You won't find these waffles at any continental breakfast or sit-down diner... Chain or not. These Waffle Handers® are sitting pretty waiting for their tops to be put on. Belgiis Build It Breakfast; Local Sausage, Aged Cheddar Cheese and Two Fresh Cracked Eggs.